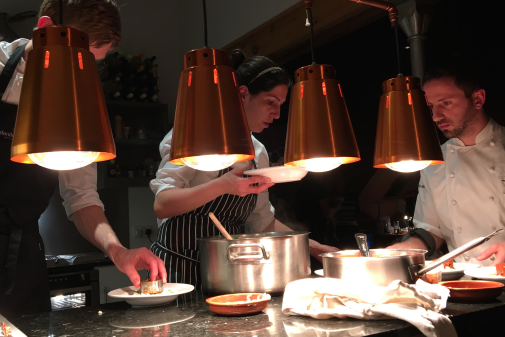 The Elmore Jam is a long-running supperclub with fine food and live music. This December they are working with chef Danilo Cortellini and a jazz trio for three nights at Spianata Bakery, near to The Shard. Tickets cost £49.50, and only two night - Friday 8th and Staurday 9th are still available. Don't miss this one! Our chef tonight is Danilo Cortellini who is well known for many culinary triumphs including the MasterChef Professional Finals a couple of years ago, some say he should have won. Currently he is also Head Chef at the Italian Embassy in London's Grosvenor Square. Our venue is Spianata Bakery which is in one of London's newest streets sandwiched between Tower Bridge and The Shard!*! Plus it has good transport from London Bridge."